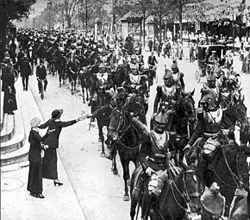 The Battle of the Frontiers was a series of battles fought along the eastern frontier of France and in southern Belgium shortly after the outbreak of World War I. The battles represented a collision between the military strategies of the French Plan XVII and the German Schlieffen Plan. The British Expeditionary Force (BEF) fought at the battle at Mons which, by virtue of its position facing the critical right wing of the invading German army, had a significance that far exceeded the number of men engaged or casualties inflicted. The defeat of the French offensive in the Battle of the Ardennes led to a general retreat to the Marne River where the French and British forces regrouped for the defense of Paris. The Schlieffen Plan was the German General Staff's early 20th century overall strategic plan for victory in a possible future war where it might find itself fighting on two fronts: France to the west and Russia to the east. The First World War later became such a war with both a Western Front and an Eastern Front. The plan took advantage of expected differences in the three countries' speed in preparing for war. In short, it was the German plan to avoid a two-front war by concentrating their troops in the west, quickly defeating the French and then, if necessary, rushing those troops by rail to the east to face the Russians before they had time to mobilize fully. The Schlieffen Plan was created by Count Alfred von Schlieffen and modified by Helmuth von Moltke the Younger after Schlieffen's retirement. It was Moltke who actually put the plan into action, despite initial reservations about it. In modified form, it was executed to near victory in the first month of World War I; however, the modifications to the original plan, a French counterattack on the outskirts of Paris (the Battle of the Marne), and surprisingly speedy Russian offensives, ended the German offensive and resulted in years of trench warfare. The plan has been the subject of intense debate among historians and military scholars ever since. 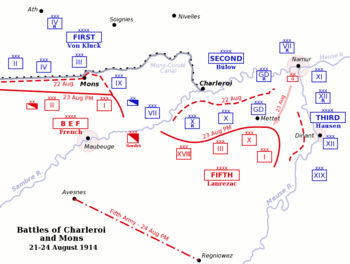 Schlieffen's last words were "remember to keep the right flank strong", a request which was watered down by Moltke.